Edge-match translucent panels for uniform applications. 3form Align architectural hardware allows you to edge-match translucent panels for uniform, stunning applications with the different types and gauges of 3form translucent material. 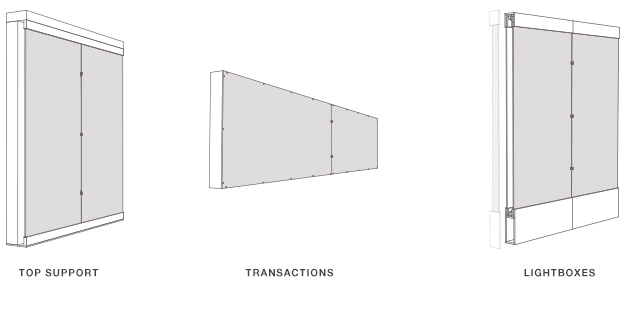 These seemingly simple components allow you to join panels together that are flat, have a radius, or have complex undulation with flat edges, as shown below. 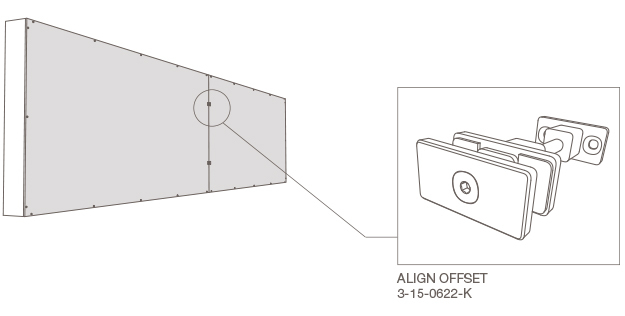 For applications that require the panel alignment of Align hardware but with an additional rigid attachment to a wall (3–4" from the back of the panel). 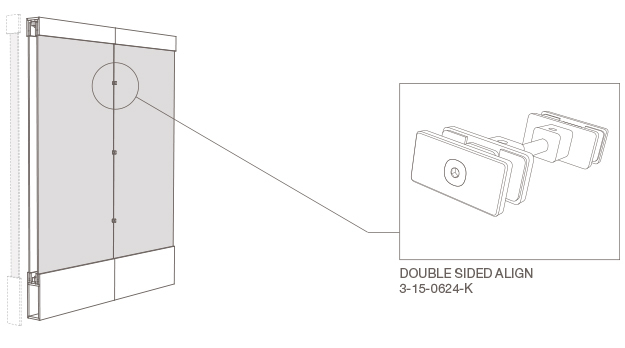 This hardware can be used with top support, transactions and lightboxes as well as other applications that require both panel alignment and rigidity. 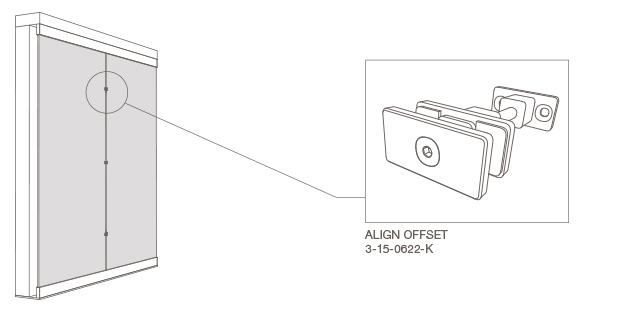 There are two different aesthetic options: ALIGN Curve and ALIGN Smooth. 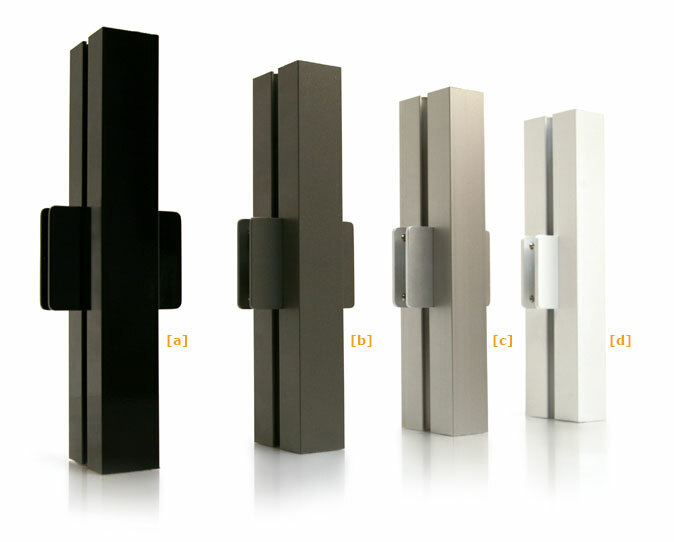 These allow you to use hardware that has a similar appearance to Point Support and Suspend hardware from 3form. 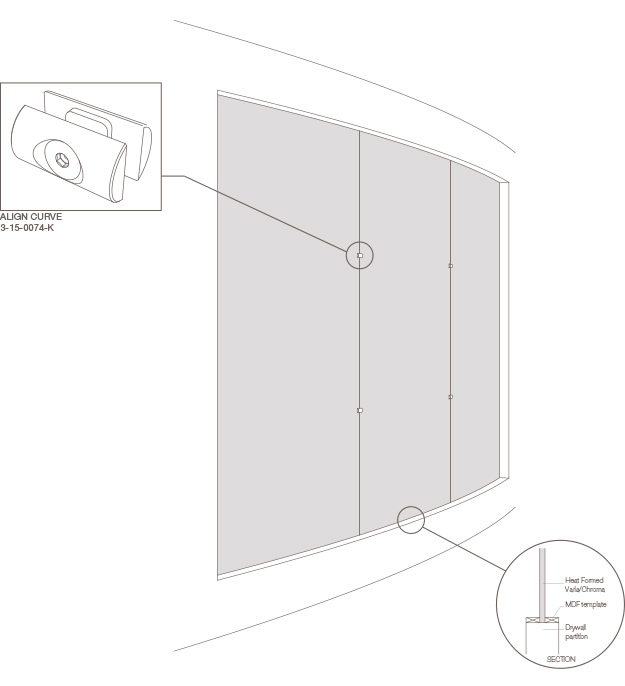 There are various ways to capture panels at the top and bottom. 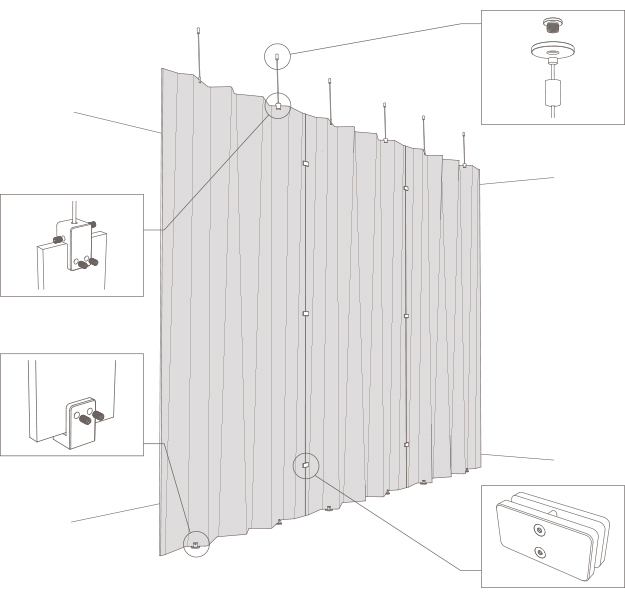 In this solution the panels are captured in the space between an MDF template, but panels could be captured by a U-channel, cable hardware, thru-holes with standard bolts, etc. However, most resin materials are inherently slightly flexible or have some gauge variance. The ALIGN hardware is used to bring these panels together and create a clean installation with a very minimal reveal. This allows installations to be accomplished without using adhesives on the job site. 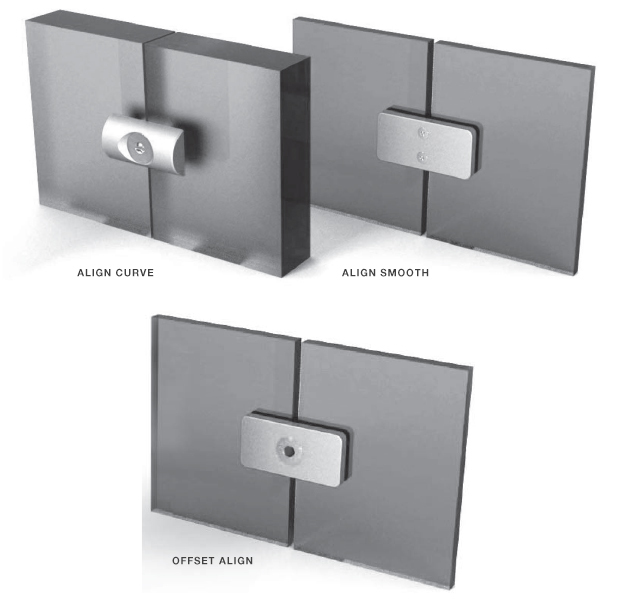 3form ALIGN hardware can work with a radius as small as 24" on curved panels. 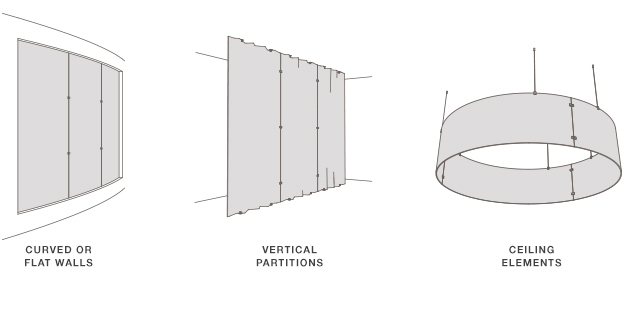 Partitions can be created using cables or surface brackets at the top, and surface brackets at the bottom. This particular application uses Fixed Surface Brackets on the top and bottom with thru-holes to hold the panel secure. The panels are then joined with the ALIGN Smooth hardware. This is done in this application with complex-formed panels that have flat vertical edges. 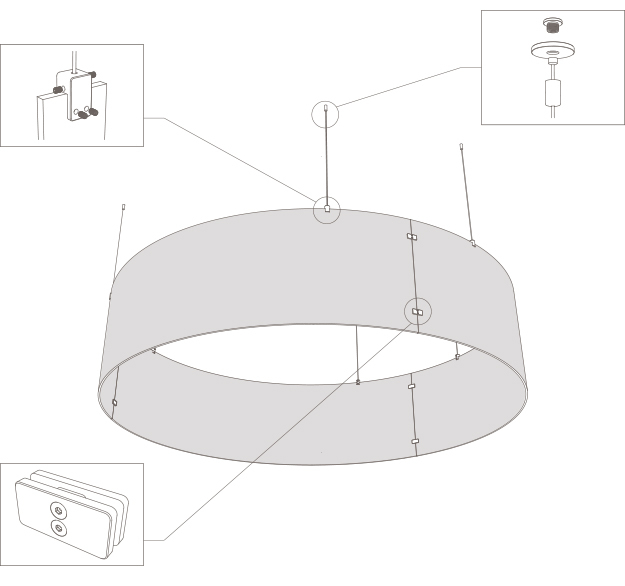 This application shows curved panels suspended from the ceiling using cable hardware with the 1” Top Gripper that are then joined using the ALIGN hardware.